The Superman Fan Podcast: Episode #386 Part II: Superman Family Comic Book Cover Dated September 1965: 80 Page Giant #14! 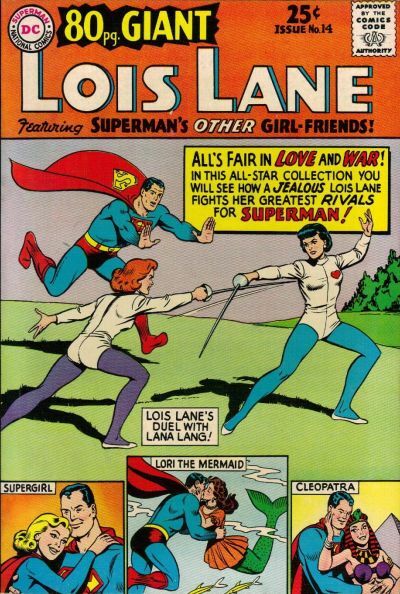 A good collection of stories dealing with Lois and some of her rivals for Superman's affections. I must say, the only one of Superman's sweethearts who ever seemed to have a clear path to his heart is Lori Lemaris. He fell in love with her before he even knew she was a mermaid, and proposed to her without any tricks or schemes on her part. He was even willing to leave the surface world to be with her. I know many people dismiss "Superman's mermaid girlfriend" as the height of "Silver Age silliness", but I think the love, loss, and enduring friendship between them is quite poignant. I couldn’t agree more. In an era of simple storytelling for a young audience, theirs was an adult and sophisticated relationship. Plus she never schemed to trick him into marriage. But then it seems like they undermine all that by having her fall for the cute doctor because the story needs them to split up. I really liked Lois Lane's Super-DAughter. It was the only one that didn't involve the scheming and Lois felt real. I honestly felt for her when she felt left out because for as much as she love them, Superman and Supergirl live in a world that she just can't be part of. And even though Superman and Supergirl were trying to help, you could easily feel for Lois because they could do everything they do, plus "her chores". Their intentions are good, but they're unaware of the unintended consequences of their actions. Of course, the stuff with the social worker was played for laughs, but I hated the ending when Superman blames Lois for the adoption falling through. Typical Silver Age treatment of Lois. So, I had to switch podcatchers, and when I did, I went looking for your RSS feed, and haven't found it, ANYWHERE, so I started manually downloading them, but this one keeps failing, saying 'Failed - No File'... help!